Yesterday’s Bulletin item concerning Joel Russo shooting at 1680 yards (almost a mile) created a stir. 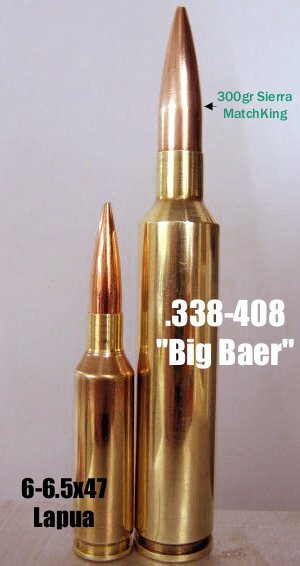 We asked Joel for more info on his cartridge, a .338-408 “Big Baer”. This is an improved version of the .408 Cheytac, necked down to .338 caliber. Joel is currently using it with the 0.768 BC Sierra 300gr MatchKing. The parent .408 CheyTac brass, which costs over $2.00 per case, is produced by TTI Armory and Jamison Int’l (sold by Grafs.com). The TTI brass is considered superior, but it is harder to get. Yes, readers, that’s a mighty big case. H20 capacity of the parent case is a mind-blowing 159 grains! Powders of choice for this cartridge are ultra-slow burners such as H50BMG, Norma MRP, VV N170, and Retumbo. Joel is using H50BMG powder with Federal 215 primers to push the Sierra 300gr MK over 3150 fps. Joel tells us: “The parent case is the .408 Cheytac. I neck it down to .375 first, then to .338, then turn the necks. The shoulder blows out on the first fire-forming shot. Speaking of my .338-.408 rifle, would you believe I put a used barrel on that thing? I re-contoured it and fluted it, then gave it to Bruce Baer. It was originally chambered by Bruce as a .338-.378 Wby. It only had about 125 rounds through when it was pulled. The rifle flat-out shoots, so I guess the theories about re-contouring and fluting barrels are myths. Joel is a stockmaker who produces quality High Power, Long-range Benchrest, and multi-purpose stocks. For more info on the ultra-long-range shooting, contact Joel at (717) 805-0940, or jkrussos [at] comcast.net . Share the post "Heavy Artillery — Russo Reveals the .338-408 'Big Baer'"
Shooting Sports USA, an NRA publication for all types of competition shooters, has compiled a comprehensive event calendar covering matches from April 2008 through the end of the year. A wide array of disciplines are calendared, including: Air Pistol and Rifle, Bullseye Pistol, F-Class, Rifle and Pistol Silhouette, Lever Action Silhouette, CMP matches, Black Powder Target Rifle, and NRA Highpower. The Highpower Rifle listings are extremely comprehensive, with over 100 match listings, including all notable State Championships. Readers can also download a free copy of Shooting Sports’ “Score Sheet”. This publication features recent match reports from throughout the country. The emphasis is mostly on small-bore silhouette and position shooting, but there are also reports on pistol, High Power, long-range prone, and Black Powder events. It’s an interesting read and some of our Forum members are featured. Share the post "Shooting Sports Match Calendar Available"